Fira is the capital of the island and the most important village. 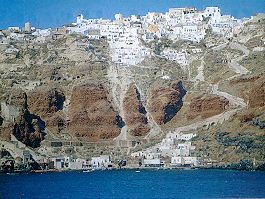 Early in the 19th century the capital of the island was moved from Pyrgos to Fira. After the earthquake of 1956 a part of the town was destroyed (only a small part of the 18th century buildings were saved). Fira is perched on the edge of an impressive cliff 260m high and offers a great panorama over the submerged volcano. It is made of many white painted houses in stepped streets with blue domed churches and sun-bathed verandas. Plateia Theotokopoulou (Theotokopoulou Square) is the main square of Fira and it is where all the locals meet. The small streets during peak season period are crowed and filled with all kind of shops, jewelleries, cafe, restaurants, bars and night clubs. The main road of 25 Martiou (25th March) intersecting the square and is lined with travel agencies. The bus and the taxi station are located at the begining of the road also. Erythrou Stavrou, one block west of 25 Martiou, is the main commercial thoroughfare. Another block west, Ypapantis runs along the crest of the caldera and provides some staggering panoramic views.